Drain your soaked nuts on a paper towel then set aside. Warm your honey or maple syrup over medium heat for about a minute, until it has liquified. Stir in the nuts, cayenne or cinnamon and sea salt. Mix to combine thoroughly. 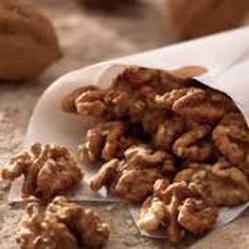 Spread the nuts in a single layer on a cookie sheet lined with parchment paper. Bake the nuts for 20 minutes, then remove and let cool completely.